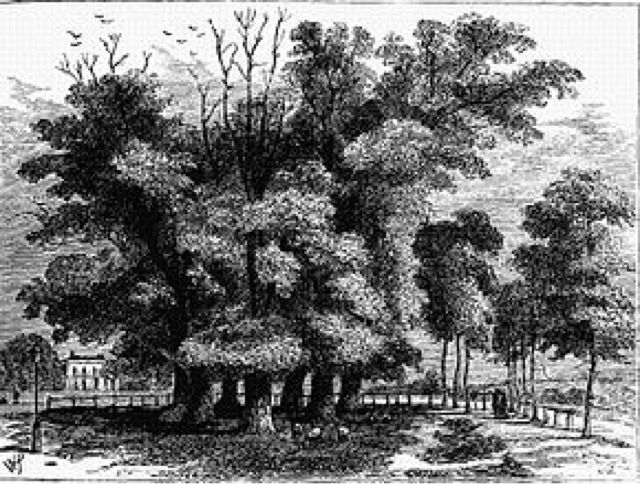 The Seven Sisters in London, 1830. One man died and 10 people were injured after a van was rammed into a crowd of worshipers on Seven Sisters Road, near a mosque in north London, in the latest terror attack to hit the UK in 2017. 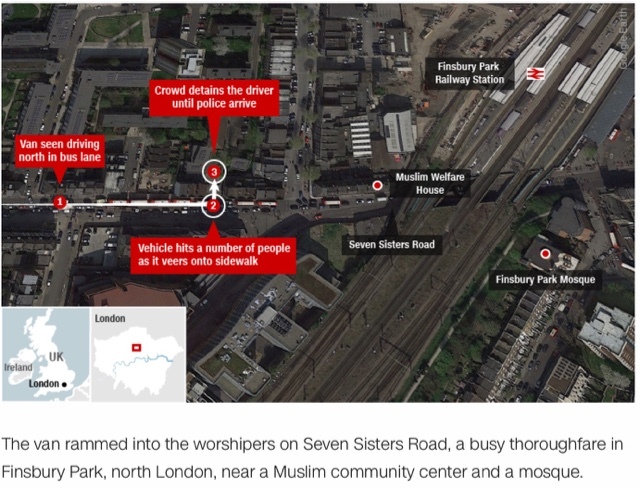 Eyewitnesses reported chaotic scenes as the incident unfolded just after midnight local time, on June 19, 2017, when evening Ramadan prayers had finished. 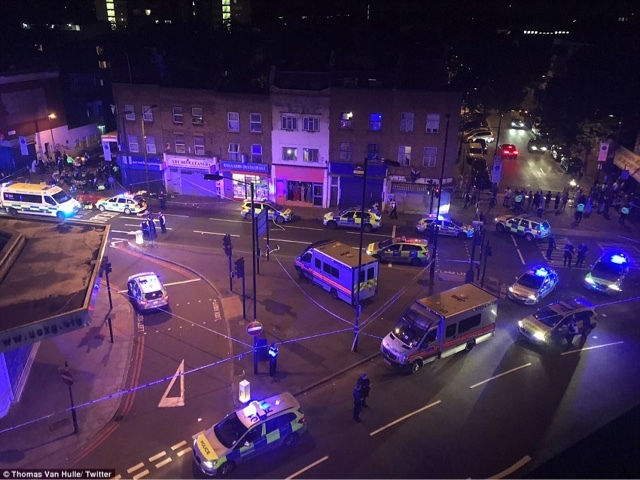 A 48-year-old white man was wrestled to the ground by members of the public and then arrested at the scene on suspicion of attempted murder. He was yelling, "All Muslims must be killed." ...from the Stamford Hill Road in the Parish of Tottenham , in the said County of Middlesex, nearly opposite to certain Trees called the Seven Sisters. In his early seventeenth-century work, Brief Description of Tottenham, local vicar and historian William Bedwell singled out the walnut tree for particular mention. He wrote of it as a local 'arboreal wonder' which 'flourished without growing bigger'. He described it as popularly associated with the burning of an unknown Protestant. There is also speculation that the tree was ancient, possibly going back as far as Roman times, perhaps standing in a sacred grove or pagan place of worship. The location of the seven trees can be tracked through a series of maps from 1619 on. From 1619 they are shown in a position which today corresponds with the western tip of Page Green at the junction of Broad Lane and the High Road. With urbanisation radically changing the area, the 'Seven Sisters' had been replanted by 1876, still on Page Green, but further to the east. Contemporary maps show them remaining in this new location until 1955. The Seven Sisters Road is also traditionally the road between Highbury and White Hart Lane, the football grounds of Arsenal and Tottenham Hotspur. Spurs are known as the Yids, because of their supposed Jewish tendencies. Arsenal were rumoured, and reported in the tabloid press, to have been Osama bin Laden's team during his time in England. Arsenal purchased the ground Highbury was built on from the Church of England. The then-chairman of Arsenal, Sir Henry Norris, was also archdeacon of the Unified Grand Lodge of England. The nearest tube station is also named "Arsenal". There is also an old film called "The Arsenal Stadium Mystery". Black and white. An armed man who deliberately rammed his car into a police van in Paris on Monday, 19 June 2017, has been taken down by officers and is dead, French authorities said. Gerard Collomb, France's interior minister, told reporters the attacker's car contained weapons and explosives. No police officers or passersby were wounded, an Interior Ministry spokesman said. It's the fifth time in four months that security forces have been attacked in Paris. Some unconfirmed reports note the man is a well-known figure in the right-wing. Although you mention the trees, Seven Sisters is also the Pleiades My father who spent many years working in that area tells me they always referred to it as the constellation or just the stars! If you are going to make Seven Sisters connections, they're also the cliffs on the South coast, if you go straight South from London you'll get there. "Seven sisters" is the name of strange stalinian skycrapers in Moscow. Arsenal have been involved in several scandals. Norris, mentioned above, was banned from involvement in football for making illegal payments, after also allegedly conspiring to get Arsenal voted into the top flight.